If you have any questions, just give us a call at (603) 444-7444! The new and improved Chalk Paint® 101! Have you been wanting to try Chalk Paint® by Annie Sloan, but aren't really sure where to start? This beginner workshop is a great starting point!! Have a small piece you've been wanting to paint but don't have the space to do it in? Do you already have a plan for your piece, but might like a trained Chalk Paint® expert around for some gentle guidance and helpful tips? This is the perfect workshop for you! Come with a plan, a piece that you can (easily) carry, and we provide the rest. Use our paint, brushes, stencils, gilding wax, and other products to transform your piece into something unique and magical! It is required that you have taken "Chalk Paint® 101" or "Introduction to the Annie Sloan Method" to make sure that you have experience with the application of this paint and wax, as this is not an instructional workshop. Pick from our selection of fabric, choose a coordinating paint color, and transform a chair into something totally new! 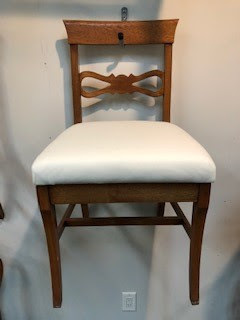 We will reupholster your seat for you while you paint, so you will leave with a chair that has been redone from top to bottom. Create a beautiful little chalkboard sign to help countdown to Christmas. This "Make & Take" workshop will allow you to make a great gift for all the Littles in your life who can't wait til the Big Guy squeezes down the chimney!